We’d love your help. Let us know what’s wrong with this preview of Swords around a Throne by John R. Elting. To ask other readers questions about Swords around a Throne, please sign up. The amount of research that must have gone into this book blows my mind. Every now and then you tend to lose track with all the numbers and names of countless combat units. But the chapters on 'Les Maréchaux d'Empire', Napoleon's allies and the ennemies of the French Republic/Empire are some of the best 'napoleonic pages' I have ever read. However, the layout of this book is terrible, and it certainly could have used a few chapters about the period and history before diving right into uniformology. Also, color plates would definately enhance the sections about uniforms. I would rate this between 4 and 5 stars for its readability, but I finally went for 5 since this was the book that introduced me to Marshal Louis-Nicholas Davout in the section dealing with Napoleon's marshals. 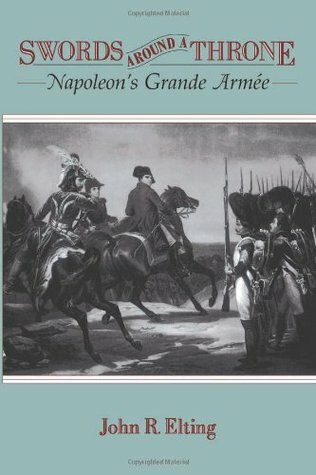 Besides that section the book deals with practically every facet of Napoleon's Grande Armee. The research is phenomenal. Admittedly, some of the material is somewhat dry; but if you are interested in knowing more about how Napoleon gained his reputation, this book helps. Utterly fascinating dissection of how the Grande Armée was put together. From the cavalry, infantry and artillery through the veterinary services, logistics services, MP, even down to the vivandières and other camp followers, every part is detailed and discussed. Not strictly a traditional history - if you want to know where, how and why the battles were fought, look elsewhere - this is more of an encyclopedia. Every chapter discusses a different part of the army. In these chapters, the history w Utterly fascinating dissection of how the Grande Armée was put together. From the cavalry, infantry and artillery through the veterinary services, logistics services, MP, even down to the vivandières and other camp followers, every part is detailed and discussed. Not strictly a traditional history - if you want to know where, how and why the battles were fought, look elsewhere - this is more of an encyclopedia. Every chapter discusses a different part of the army. In these chapters, the history what is under discussion is told: say, how the line infantry changed from pre-Revolutionary times up until after Waterloo. Also included is an in-depth description of the uniforms worn (and how these changed over time), the branch's TO&E, how they marched, how they camped, what they were (supposed) to carry, how they got paid. Just an incredible depth of information. While this could have been a set of very dry information dumps, instead the author writes with a "earthy" approach. His prose is littered with pertinent anecdotes and opinions, usually to good effect. Sometimes. however, to the detriment of the subject at hand. Which is why I cannot give this 5 stars, despite my enjoyment of it. Too often the biases of the author shine through, shifting attention from the point being made to the author's opinion. The author appears to hate the Russians, Spanish, Italians, the Bourbons, the Committee of Public Safety, the Directorate, Bernadotte, and the Austrian cavalry. This list is not all-inclusive, I'm sure I missed some. Hugely overrated work. This is simply the consolidation and systematic organisation of an admittedly wide reading of Napoleonic memoirs, which is enough to make it just interesting. There is no evidence of any real actual research, or analysis of all this reading and there is of course a total partiality towards Napoleon. I'm probably being harsh and reacting against the adulation usually reserved for the work when I say: fan boy history for hero worshipers, and little more. A massive rambling book, written with more gusto than one would expect. There is a lot of information here, and I particularly liked Elting's discussions of the Restoration army. He also has his share of opinions, such as Napoleon being better for the navy than most would say, arguing that by 1816 the French navy would have been ready to take on the British again. Overall, it might be too long and too conversational, but its never dull. This tome on the Grande Armee is a very approachable yet detailed discourse on the composition and inner workings of Napoleon's greatest army. Packed with anecdotal stories, it gives a functional history of the army that Napoleon led rather than an operational history, explaining how each different service worked within the army and how it grew to it's height. Covering everything from the navy to logistics, this is a good book to catch for and understanding of the army. This is a superb book. A step by step outline of every aspect of the life of Napoleon's Grande Armee. It is the perfect companion piece to Elting's Military History and Atlas of the Napoleonic Wars (written with Vincent Esposito). If it has a flaw, it is that Elting is very obviously in Napoleon's camp, but if you accept that at the start and are interested in how his army was constructed and operated, then this is the perfect book to explore that. Elting can write in an amusing fashion, but it is history as a series of anecdotes. It is thorough, but shallow, hinting at enormous information the author is familiar with but is only alluding to instead of explaining. The book is very large, and covers a wide variety of subjects, all in reference to La Grande Armee. Something of an overview, but not a comprehensive or data filled sort of study, no indeed. Great read so far. I'm not quite done with it but the author is very thorough and in-depth, revealing the genius behind much of what Napoleon did and how he managed his army. The descriptions of generals and marshals of his army really brought the past to life for me. Well worth a look if you enjoy history, and especially military history. I'm not much of a Napoleonic Wars "fan," but this was a great book to me. Elting covered pretty much the entire span of the militarized French nation, down to the Imperial postal service, daily food of soldiers, and so on. THE BEST book I've read on Napoleon's Marshals so far. I don't claim to be an expert but have read many books on the First Empire. This is a must. It's where I first read of Marshal Lefebvre's challenge to a friend jealous of Lefebvre's estate and possessions. Very well written. Gave up on this about mid-way. My favorite histories tend to be narrative rather than descriptive, and this one in particular is heavier on the names and references than details. Not badly written, but not what I was looking for. Truly a fascinating book about Napoleon's fighting men, geniuses and incompetents alike. One of those books I would want on a desert island. A joy to read. Goes into vivid detail about the look of Napoleon's army, and its attitudes and regulations, where it came from, how it viewed itself and was viewed. John Robert Elting was a soldier for thirty-five years (1933-1968), with a couple of civilian interludes as a high school instructor. His first commission had been from the Reserve Officer Training Corps at Stanford University in 1932. He combined this with summer duty in Company H (machine-guns), 163rd Infantry Regiment, Montana National Guard, and then as an officer in the Civilian Conservation John Robert Elting was a soldier for thirty-five years (1933-­1968), with a couple of civilian interludes as a high school instructor. His first commission had been from the Reserve Officer Training Corps at Stanford University in 1932. He combined this with summer duty in Company H (machine-guns), 163rd Infantry Regiment, Montana National Guard, and then as an officer in the Civilian Conservation Corps. In 1940 Elting became an ROTC instructor at Oregon State College. From then on he was continually in service until 1947 (71st Armored Field Artillery Battalion, the Tactics Department of the Armored School at Fort Knox, Combat Command B, 8th Armored Division in the Rhineland, Ardennes, Alsace, and Central Europe campaigns, 24th Field Artillery Battalion of the Philippine Scouts). In 1948 he was recalled, after a short civilian interlude as a teacher, and was assigned to the Armed Forces Information School and, from there, to the Military Academy, West Point. In 1954 John Elting's turn for overseas duty came up and he was posted to the J-2 (Intelligence) Division of the Far East Command, returning to West Point in 1957. There he began researching and writing the Military History and Atlas of the Napoleonic Wars, with Colonel Esposito acting as overall editor and advisor. Between 1965 and 1968, Colonel Elting served as G-2 of the Washington Military District, before retiring in 1968. After his retirement, Elting turned his attention to writing and research (in his own modest words, he "tried to be a historian"). He was the author, co-author or editor of sixteen books, including The Battles of Saratoga, American Army Life, A Dictionary of Soldier Talk, A Military History and Atlas of the Napoleonic Wars, Swords Around a Throne and Napoleonic Uniforms. He took particular delight in the history of Napoleon's Army - and the French emperor's campaigns - and in the study of the American Revolution, but was a considerable authority on all aspects of military history. His knowledge was deep, and he gave generously of it, and for many he served as an inspiration. He also served as a historical consultant on the Time-Life World War II book series and authored "Battles for Scandinavia" in the series.